Ramchandi College is started in the 2003 with the minimum strength of 27 students in the beginning. The college has gained at present an enrollment of 400 Students in B.A., B.com and PGDCA courses. It is a pleasure that the Government of CG. Higher education Department has accorded permission to start M.com, M.A. Hindi and DCA courses from the session 2013-14. For having a good Reputation and for good Result, this college is affiliated to Pt. Ravishankar Shukla University Raipur. Ramchandi Mahavidyalaya RM, Saraipali offers various graduate courses as well as Post Graduate courses. 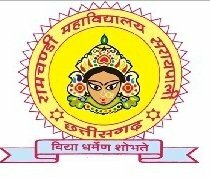 Ramchandi Mahavidyalaya RM, Saraipali is affiliated to Pandit Ravishankar Shukla University (PRSU), Raipur. List of facilities available at Ramchandi Mahavidyalaya RM, Saraipali for students. This page was last modified on 21 August 2013 at 18:08.